Saturday, Parson's Chicken & Fish launches brunch from 9 AM to 3 PM. (Bless them for that most un-Logan Squarey opening hour.) Dishes include chilaquiles and chicken and biscuits; the drink side will not be neglected. • Sunday will be the Holidose edition of Dose Market, from 10 AM to 4 PM at 1st Ward; check out the lineup of chocolate makers, clothes, crafts, spirits, and other cool stuff here. • Cicchetti, the new Venetian bar and small-plates restaurant from restaurateur Dan Rosenthal (Harry Caray's) and executive chef Mike Sheerin (Trenchermen), opens Monday. Beyond its Italian eats and Harry's Bar-inspired cocktails, it's also going to be the first restaurant in Chicago to open with a Green Seal certification for its use of sustainable materials in both construction and the operation of the kitchen. It's at Erie and Saint Clair, just off Michigan Avenue—and quite a sign of how Michigan Avenue dining has changed in the few years since the Purple Pig opened. • Also Monday: So you want to get in on Alba truffle action this year, but Spiaggia's $260-per-person white truffle seven-course dinner seems a bit pricey? How about almost half off? Monday only they'll do a $135 four-course version, with $55 optional wine pairing. Go here to get tickets. • Tuesday you can go to the Fountainhead for its holiday gala. For $42.06 (that's the address), you'll enjoy three courses plus apps and dessert, but more importantly, drinks made with goodies from cohosts Few Spirits and North Shore Distillery. Go here for more info. • Also Tuesday, Found's Amy Morton and chef Nicole Pederson will do Pagan Night, consisting of a five-course dinner, drinks, and tarot readings, at Ward Eight in Evanston. Info and tickets are $80 here and benefit Connections for the Homeless. • Thursday a new pizza chain comes to town: Blaze Pizza lets you pick your own toppings and then watch as the pizza cooks in a stone oven (looks to be gas-fired) in about three minutes. OK, that's not really that different from other pizzas of that type, but if they can make it work for lunch crowds to get good pizza freshly and quickly, good for them. The first of a bunch of them planned (by Levy Restaurants) for Chicago will be at 953 W. Belmont. • A week from Saturday, Porkchop will have an ugly-sweater holiday party, which it would not be the holidays without. • A week from Sunday, Paul Virant's Vie will offer a champagne dinner, for those of you for whom New Year's Eve is too far away. It'll be a lush five-course meal of truffles and bone marrow, with appropriate bubbly. It's $125 per person; call 708-246-2082 for reservations. • On Christmas Eve, Osterio Via Stato will have a traditional Feast of Seven Fishes Italian Christmas dinner for $48.95 per person. See the menu here (scroll down a bit). • Big Jones is doing a creole Reveillon dinner on Christmas Eve. What's that? Why, Paul Fehribach has just the blog post to tell you all about it. 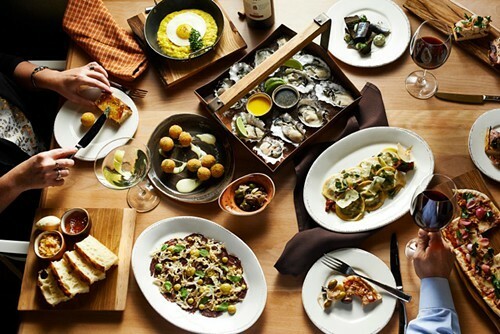 • There will be more actual New Year's Eve announcements to come, no doubt, but start with the five-course Giro d'Italia running at both Letizia's Fiore and Enoteca Roma for $65 including food and wine; there are three seatings, the last of which runs through midnight. • Thing happening all month: Telegraph's latest in its wine dinner series (which I wrote about here) is unusual California wine producers. Find out more here. • Things to read: Hey, I know you know better, but you probably have friends who are all like, Why should I pay $10 for some artsy yuppie free-range artisanal pho when I can get it for like $5, man. Make them read this. Or get new friends. • I ate at the French Laundry in Napa last weekend, and came away with thoughts about how Chicago dining got to be what it is. Also, white Alba truffles are involved.